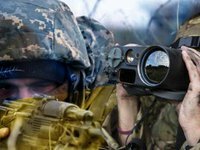 Illegal armed formations attacked Ukrainian army positions in Donbas, eastern Ukraine, twice from 00:00 to 18:00 Kyiv time on Friday, February 1, no casualties have been reported. "Members of the Joint Forces have not suffered from criminal attacks by the Russian occupation forces," the press service of the Joint Forces Operation (JFO) said on Facebook in an evening update on Friday. Enemy troops used proscribed weapons once during the day. They shelled Ukrainian positions near the village of Pavlopil, Donetsk region's Volnovakha district, using 82mm mortars, large-caliber machine guns and small arms. JFO positions near the village of Khutir Vilny close to the village of Zolote-4 came under fire from grenade launchers, large-caliber machine guns and small arms. The Armed Forces of Ukraine fired back, keeping the situation under control, the update said.